Less than 24 hours to go before BSF 2018 opens its doors and many of you like ourselves have been hoping for Orange Ngaew Dino By Pang Ngaew x Unbox Industries make it to online sales due to the fact we can’t make it to the event. 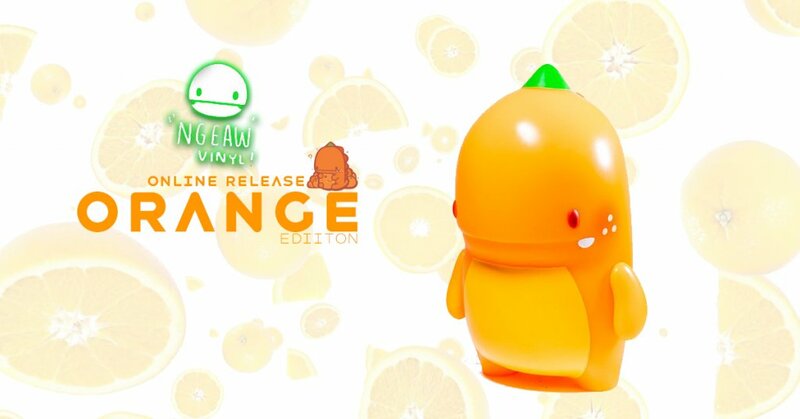 Unbox has just sent out the newsletters with the good news that Orange Ngeaew Dino will have an online release. Like we said previously, over the past couple of years, we’ve seen Thailands Nqaew’s little dino in resin format. Fast forward to 2018 Ngeaw Dino made its debut at Thailand Toy Expo in soft VINYL! The resin releases couldn’t keep up with the demand so seeing a vinyl version come to life, powered by the folks at Unbox Industries will definitely see collectors have a smile on their faces. We are thrilled to offer an allocation of this special release edition of Thailand based artist Pang Ngaew’s super cute dinosaur. This particular version was produced for this weekend’s Beijing Toy Event so we had to make sure our international customers also have the opportunity to obtain one! If you want to get your Designer Toy news first, you should look to download our new TTC Mobile App. Designer Toy news direct to your smartphone. No dealing with social media algorithms. Find Ngaew Ngaew on Facebook.